All of our horses are privately owned. Courtesy is happy to put you in touch with the private owners to discuss the opportunity and availability of shareboarding. Please feel free to contact us. Bonnie is an 18 year old, 15.1 H, Black Roan Kentucky Mountain Horse. She is out of the Pruitt farm Vergeland in KY. Bonnie is a sweetheart. She is a confident horse that needs a confident rider and is excellent in the ring & on the trails. She has come a long way since she first arrived at Courtesy over 4 years ago. Eli is a 19 Year Old 16.1H TB/Hanoverian Cross. Eli is schooled in jumping & dressage. Garth is a 15.3H TB/Quarter Horse cross. Garth turned 24 this year! The white mark down his face is called a stripe. He has been shown in Dressage & Cross Country & usually came home with a ribbon. He is awesome! . Chief is a 15.2 HH tobiano paint gelding. Chief is a been there done that kinda guy, done trails and competed in low level dressage and jumping. He's been off for a few months, so he needs to get back into shape & we're working on it. Chief is available for a full or half lease. Hot Shot is a 15.1H registered Appaloosa. Both of Hot Shot's parents are covered with spots . He's one of our favorite lesson horses, his coloring is called bay. His full registered name is "No Spot Hot Shot". Hot Shot is 27! Illusion is 14.3 Arabian mare. She is a sweetheart who will do anything for affection, and if you rub her back she will usually rub yours to return the favor. Previously being an endurance horse, Illusion loves to go the distance on the trails; making Lu's favorite activities long trail rides and playing in the creek on hot summer days. Lacy is a registered "Breeding Stock Paint," whose name is Hobby Dun Time. Her coloring is called red dun, as evidenced by the dorsal stripe on her back and her registered name. 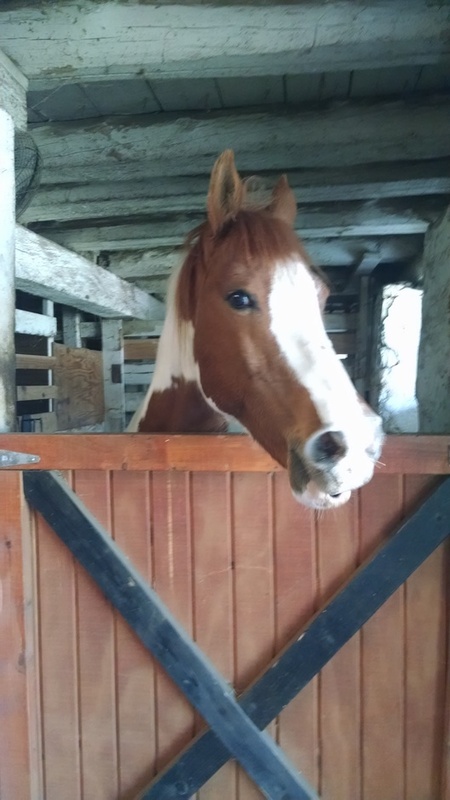 She is a very sweet & smart horse. She is not afraid of anything. If she spooks, it is only for fun. If she accidentally steps on your foot, she'll jump right off and you can almost hear her say “Sorry". She loves children & grass. Sonny is a 22 Year Old, 15.2H Gelding. His coloring is Sorrel with a Flaxen. The white marking on his face is called a blaze & he has 2 white stockings on his hind legs. His breed is Kentucky Mountain Saddle Horse (KMSH) which is known for its gait & temperament. You'll have to stop by to meet him to see what I mean. He is also registered as a Rocky Mountain Saddle Horse (RMSH).